Models of elections tend to predict that parties will maximize votes by converging to an electoral center. There is no empirical support for this prediction. In order to account for the phenomenon of political divergence, this paper offers a stochastic electoral model where party leaders or candidates are differentiated by differing valences—the electoral perception of the quality of the party leader. If valence is simply intrinsic, then it can be shown that there is a “convergence coefficient”, defined in terms of the empirical parameters, that must be bounded above by the dimension of the space, in order for the electoral mean to be a Nash equilibrium. This model is applied to elections in Turkey in 1999 and 2002. 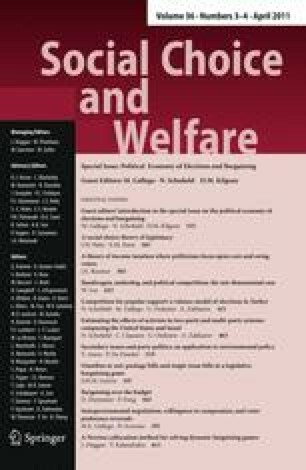 The idea of valence is then extended to include the possibility that activist groups contribute resources to their favored parties in response to policy concessions from the parties. The equilibrium result is that parties, in order to maximize vote share, must balance a centripetal electoral force against a centrifugal activist effect. We estimate pure spatial models and models with sociodemographic valences, and use simulations to compare the equilibrium predictions with the estimated party positions.